Hey friends! I have been so busy decorating the house this year and it seems like there are just too many Christmas trees! LOL! 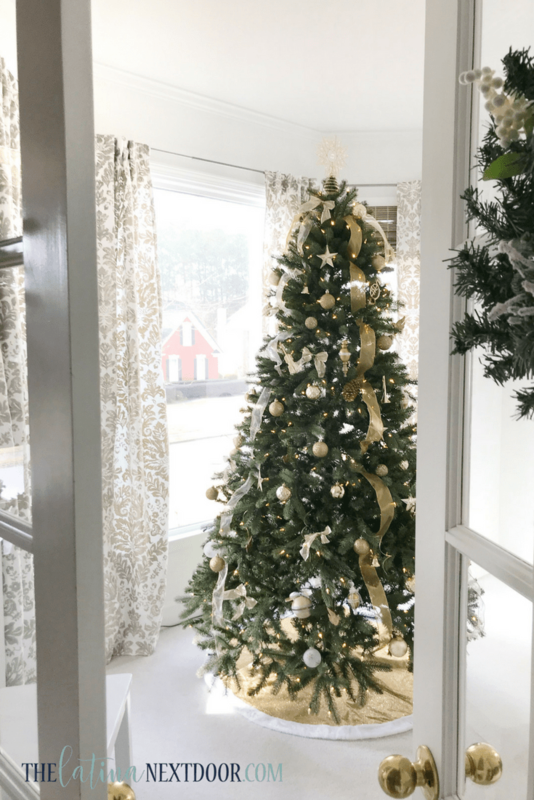 I have joined another lovely blog hop to share my second tree, since I already shared my Rustic Chic Treetopia tree we have in our great room. 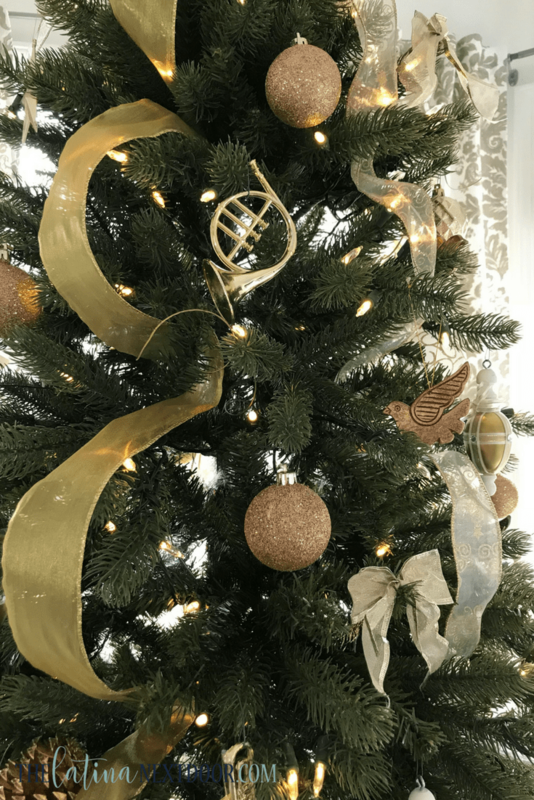 As you know, we are in our “new to us” home and my budget is a little tight so I have kept our trees pretty simple and hopefully plan on getting more “fillers” during the “after” Christmas sales this year… you know I love a sale! So, for this tree I decided to use some of my old ornaments from last year, but since those colors were kinda outdated, I chose to stick with just the gold ornaments. The tree sits in my front office towards the front of the house since it has a gorgeous bay window. But let me be frank! I have NEVER considered myself to be a great tree decorator. Yes, we have had that conversation and just like my kids, my tree ignores me. Ha! So far, we haven’t done much in this room except paint and change out the curtain hardware. This will be my first time sharing, but this is what the walls looked like before! They were hideous and they had to go. I ended up painting them Pure White by Sherwin Williams since I had left over paint from my kitchen project in my last home… I hadn’t had white walls since I lived in a rental with my parents… LOL! But it totally transformed the room and at least now I can display my tree! The window treatments I got from Homegoods and the bamboo blinds are the Home Decorators Collection Driftwood Flat-Weave Roman Driftwood shades from Home Depot. They have that grey wood tone, were super easy to order and were delivered quickly. 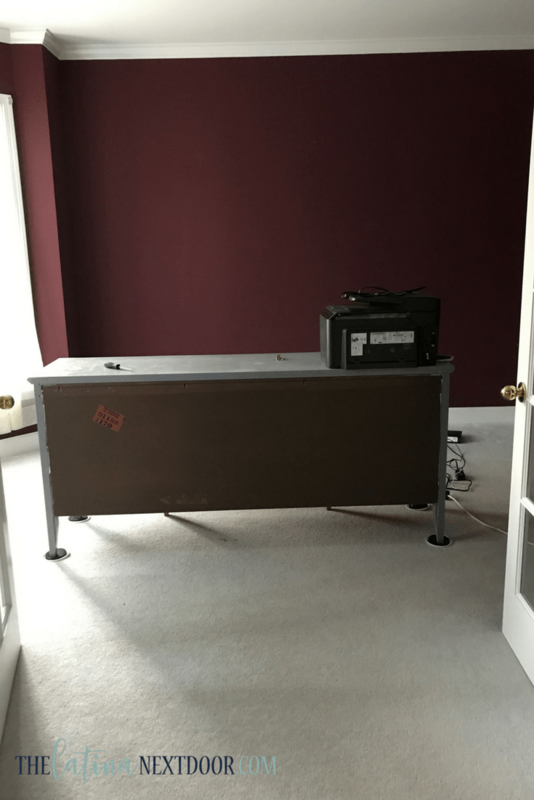 Measuring was a breeze and the fit like a glove! They look AMAZING and were super affordable. We are still trying to figure out how to install the middle one since there literally is no place to attach it (but that post is for another day 😉). Anyways, some of the ornaments I used were these DIY ornaments I made out of Easter eggs last year! They have held up pretty well. And I actually tried tucking in my ribbon differently… it’s apparent I need practice. And my ornaments are ALL plastic… at least until my kids get older. LOL! The skirt is simple and gold and with a fur trim which I like. It’s simple and classy and goes well with the “front” of the house since my formal dining room sits to the opposite side. So I am happy with it! I hope to beef it up some next year, but thank you for visiting and don’t forget to check out the others below and subscribe to my blog (to the right or down below) to stay updated with all the projects I am doing to my home. Your trees are both gorgeous. It’s so pretty in that big window. I kind of like it with minimal ornaments. Like you said, it makes it look classy. The ribbon tucked in is an awesome idea, love it too! Here from the hop! Thank you! I appreciate it! I have been playing with different ways to add ribbon. I need the practice though! Ha! Thank you Meegan…. 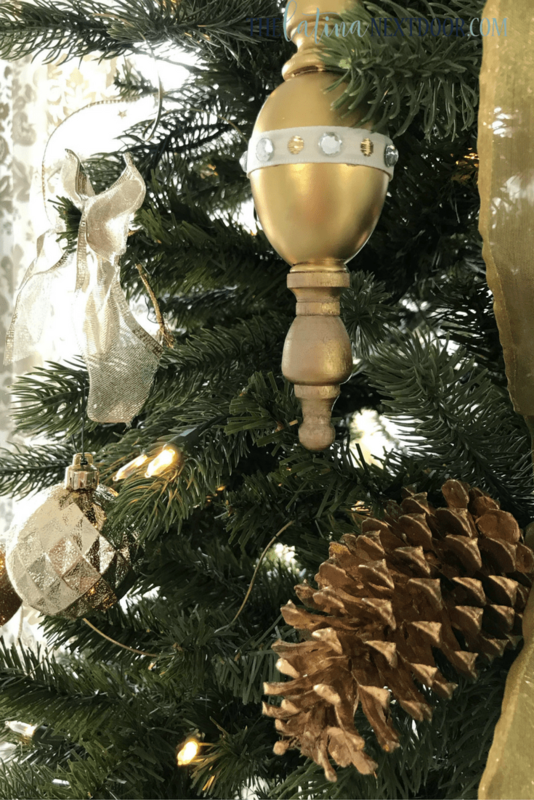 I know you say you like the fewer ornaments but I would rather overdue it… LOL! Hopefully the next one for me! Your room looks wonderful now, so bright and cheerful. I think its a smart idea to have plastic ornaments when you have small children. I enjoyed seeing your tree very much. Thank you so much Leanna! I do like the room a lot better now and I can’t wait to continue to decorate it. And I have heard too many horror stories of people getting their trees knocked down and losing all their precious ornaments, so I am trying to be as prepared as possible. LOL! I think you’ve done a great job with the ribbon. Oh My Gosh Yami, look at that window! Perfect spot for a beautiful tree. You can’t say you aren’t good at it anymore! LOL! Thank you Cindy! I am seriously trying to “up” my game! I think the window is what makes the tree, ha! I am so glad you liked it! And I loved yours as well. I’m gonna have to flock mine too now. 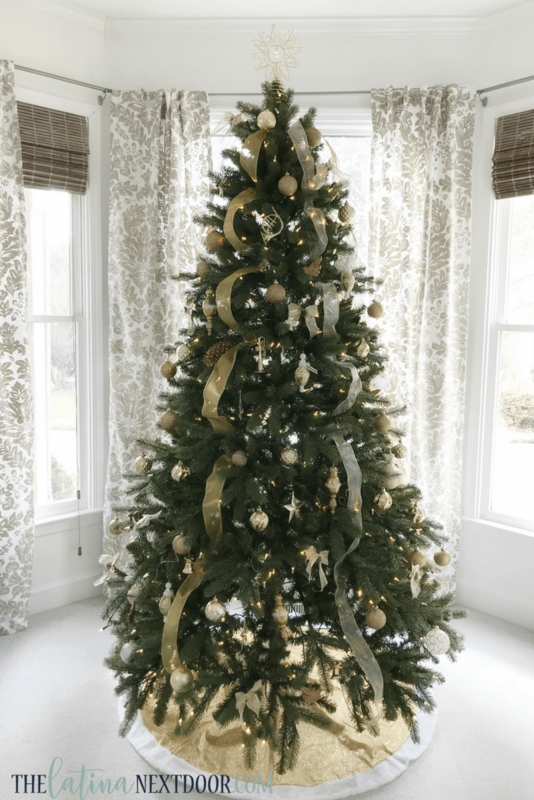 Love the gold skirt on the bottom, very pretty tree with all the gold ornaments.love the window treatments you got from homegoods. Thank you Maria! And yes those window treatments were not only pretty but they were a score and I was lucky to have found them extra long. This is a very beautiful tree, and the tree skirt really elevates the whole look. I love the beautiful room and window for the placement of such an ornate tree too! Thank you Chloe! Thank you for your sweet comment! It looks so pretty from the outside as well, which is what I hoped. Everything is still so “new” to us here in the new house, hopefully next year we can do even better. Your tree is beautiful! I especially love that fur-trimmed tree skirt! This is an absolutely Beautiful tree! Thanks for sharing ! Your tree looks great in your new updated room. The ribbon cascading down the tree is very pretty. Thank you Erlene. I need a little more practice on this ribbon, but so far I am digging it. Yami, your tree is just lovely!! You must be so excited to be in your new home! It looks beautiful! Thanks for joining us in this hop! Thanks so much and thank you for having me! It was so much fun! Your tree looks so beautiful!! Hope you have settled into your new home and have a lovely first Christmas! Visiting from the hop. I think the gold and white on your tree is very lovely and classy. And I like the changes you have made in your room so far. Good luck as your continue to work on your “new” home.